Atwood’s machine is commonly used in the classroom to demonstrate the mechanical laws of motion with constant acceleration. This device consists of two masses connected by string over a frictionless pulley. This device is commonly used in a variety of grade 11 physics problems dealing with classical mechanics. 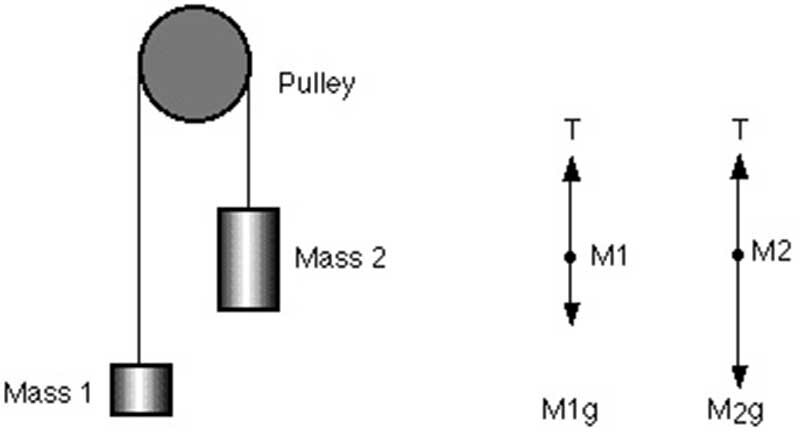 Two unequal masses are hung vertically over a frictionless pulley. If $m_1$ is 1.00 Kg and $m_2$ is 2.00 Kg, calculate the acceleration of the system and the tension in the string $($Gravity, $g = 9.81m/s^2)$.